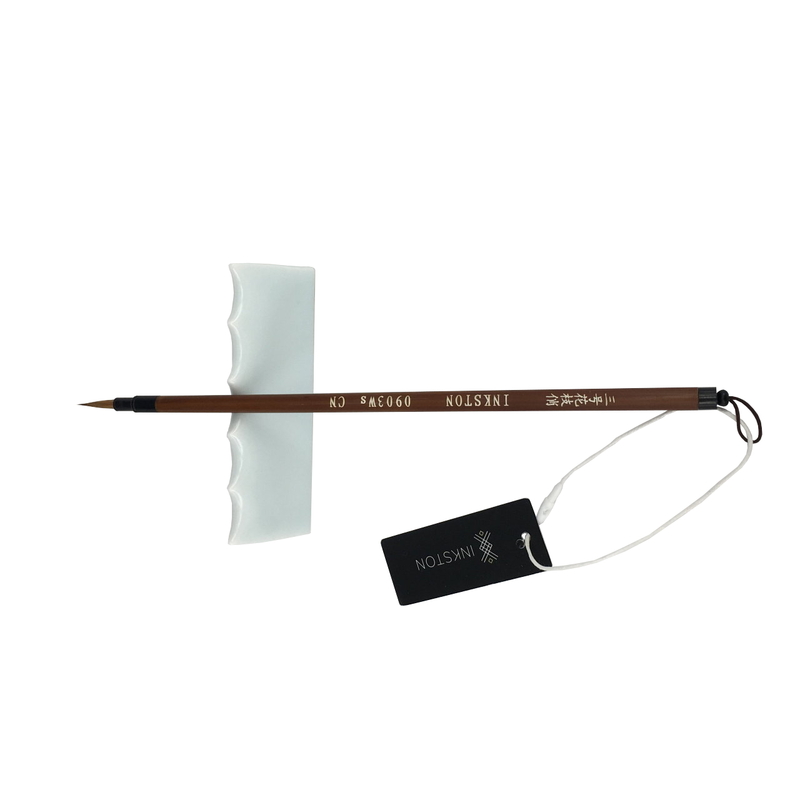 Suitable for: Chinese Gongbihua Painting (to draw narrow lines), or very small calligraphy. It is handmade with pure weasel hair. 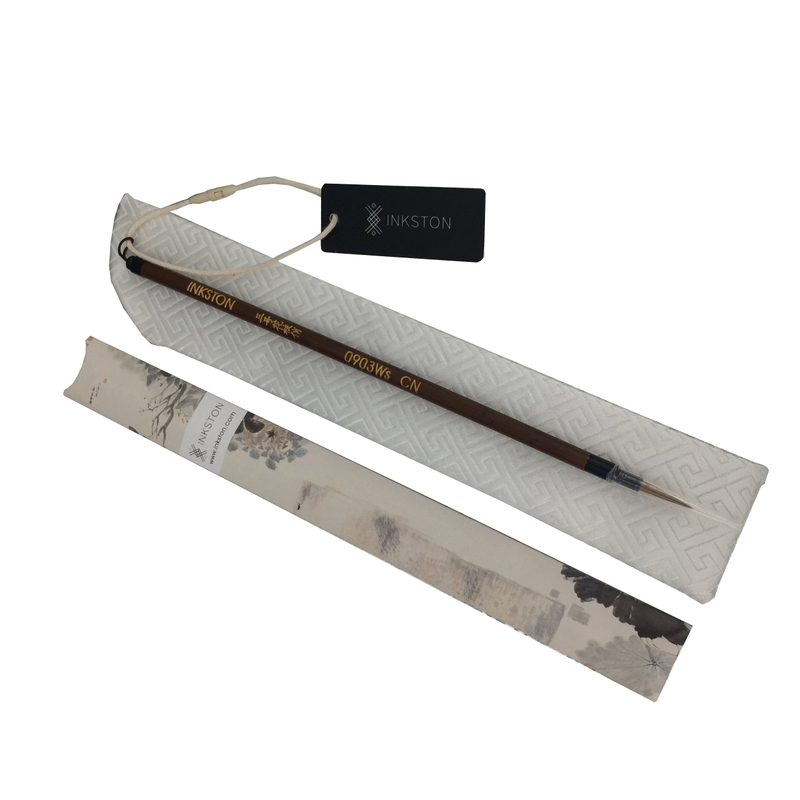 The size is very suitable for drawing narrow lines, and Gong Bi paintings. It is made with a very expereinced brush workshop in China. Bonjour, j’aime bien ce pinceau pour la calligraphie japonaise. C’était mon premier achat chez Inkston et je trouve important de souligner le professionnalisme du personnel du service à la clientèle de Inkston à Shanghai. À la réception de ma commande, j’ai réalisé que le manche du pinceau était brisé. J’ai immédiatement envoyé un courriel, avec une photo, au service à la clientèle à Shanghai. Le lendemain matin, j’ai reçu un courriel m’offrant de remplacer le pinceau ou de me rembourser. J’ai demandé qu’on me renvoie un nouveau pinceau. J’ai donc reçu,12 jours après, un nouveau pinceau avec un cadeau pour le désagrément. Enfin, j’ai trouvé que les deux personnes du services à clientèle,que j’ai contacté, étaient très courtoises et qu’ il était très facile de trouver un arrangement. Bon matériel et service impeccable. Love this brush! does great with fine detail and keeps a nice point. This brush is amazing! it keeps a constant sharp point which produces very fine and clean lines. The brushes were absolutely amazing. I was really impressed with the fine line brushes and the packaging for them with their own individual cases. The lines formed with those brushes are very nice and I’m excited to use them in my next piece! Un pincel muy versátil. Los he comprado para mis alumnos de arte oriental y los comentarios han sido muy buenos. This brush is a stiff type. It holds the point extremely well to create strong, sharp lines. 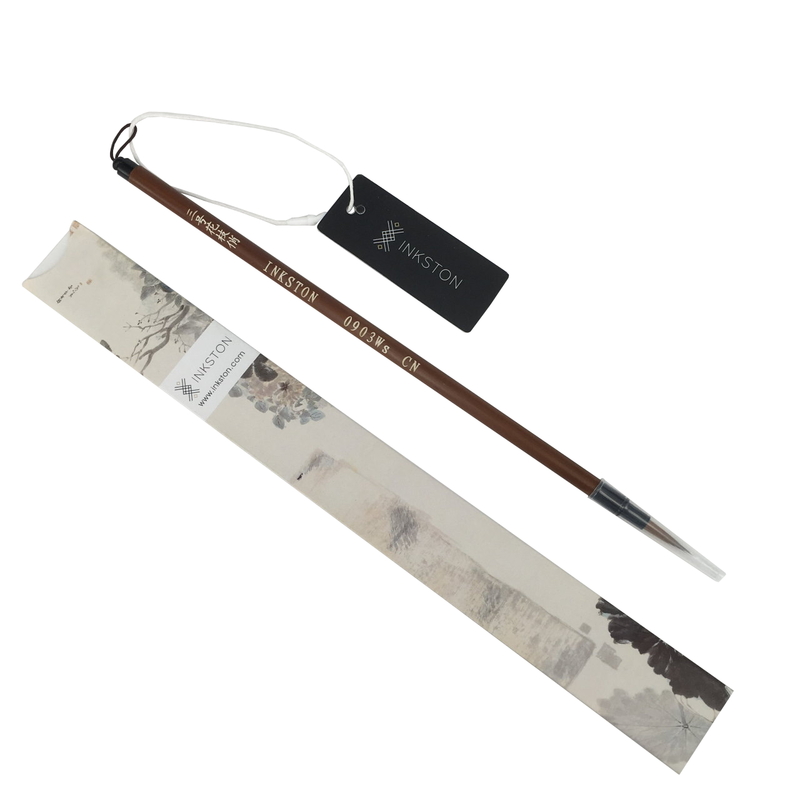 For the gong bi style, this brush is good for long lines, leaf veins, flower branches, and so on. I enjoy using this for details and when I want to create lines with a “dry bone” effect. Think plum blossom branches (Google is your friend). It has been perfect for the above uses so far. I use this brush almost every day. It’s possible to create strokes thinner then a human hair. The brush-hair is firm enough to make confident strokes (I am not an advanced user) After three months of usage still no signs of wear and tear. It’s a valuable tool. Lovely quality brush. Soft but springy and holds ink well. 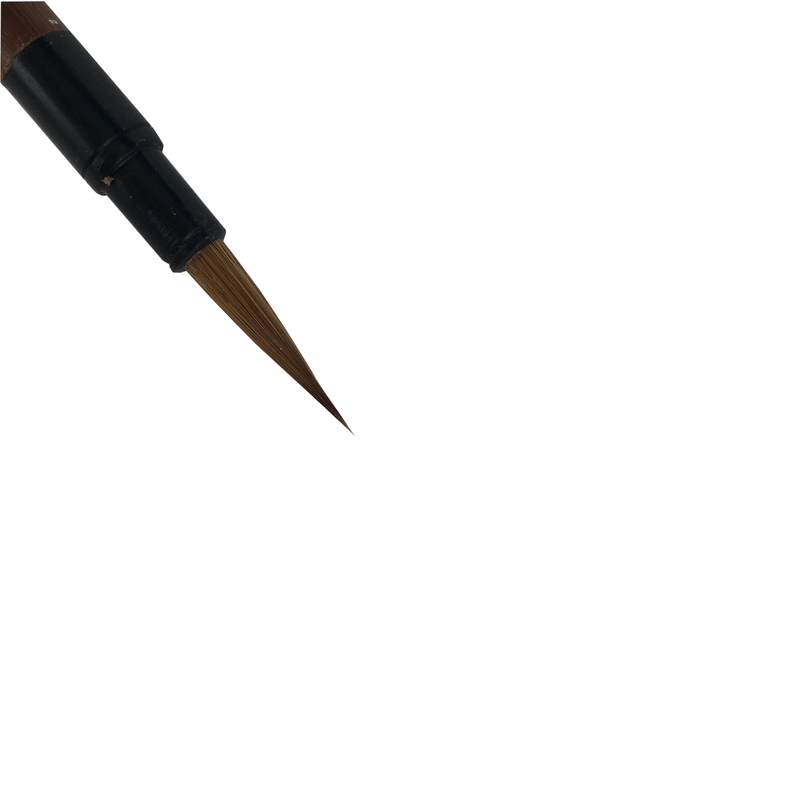 One of my favourite brushes which I use extensively for landscape painting. 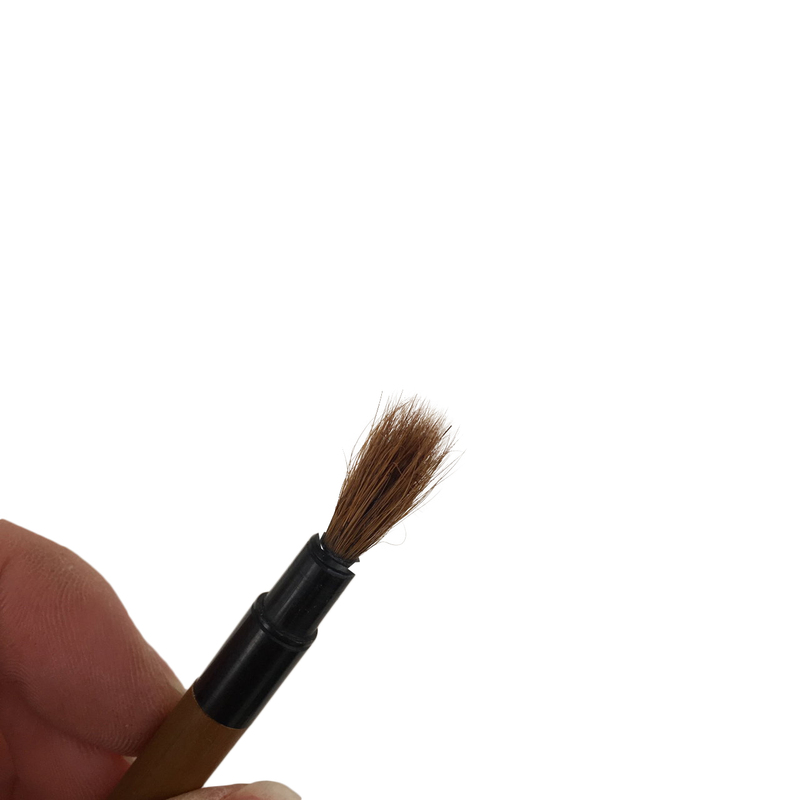 great brush for small detail, and good quality. 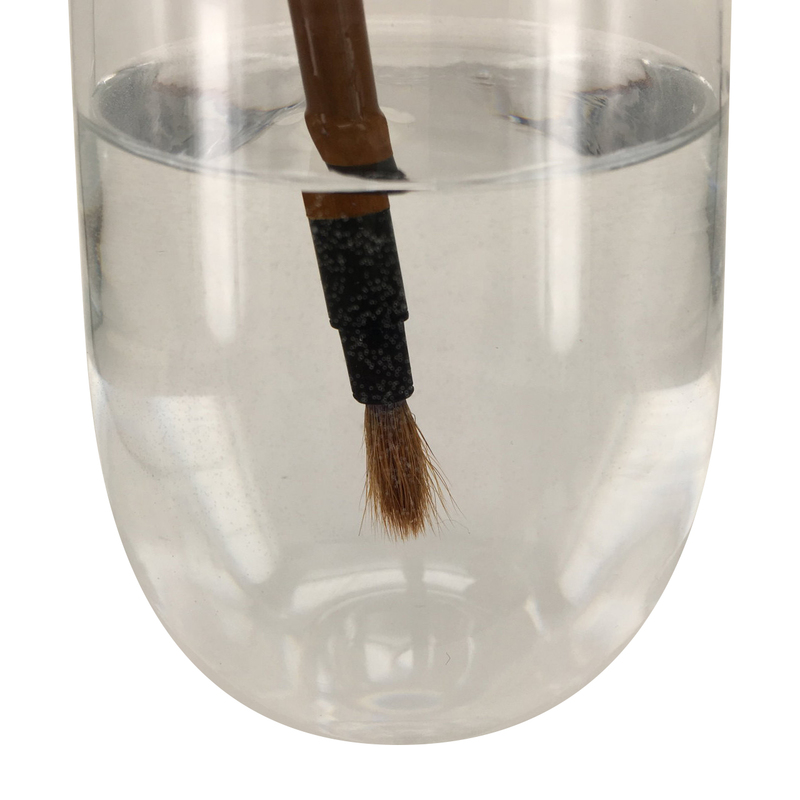 This classic calligraphy brush is useful when writing small characters. I wanted to see how a brush of this size and unusual length would work with cursive calligraphy. At it’s best, this brush is wonderful for very small cursive characters. The stiffness works nicely and is responsive. It’s more of a challenge to get a much thicker line since using the brush up higher in the bristles tends to spread the thick hairs and lets in dry spaces. However, this is expected in a brush styled like this and can make for interesting variety in strokes. I am using this brush primarily for signatures on calligraphy work and for small character cursive. Excellent construction and quality. 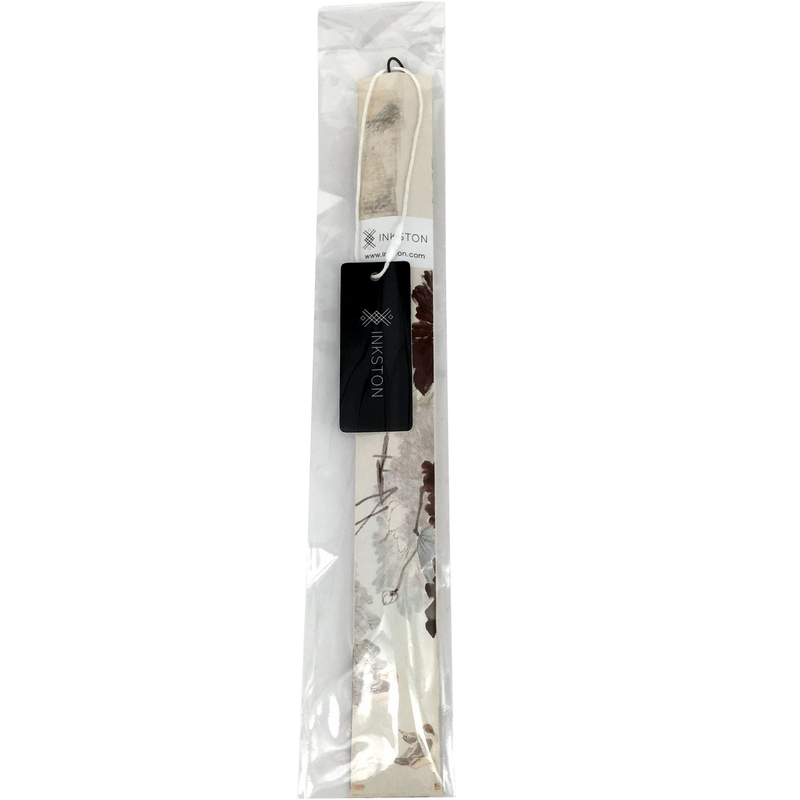 This brush has great flexibility, especially for cursive writing. It dances! 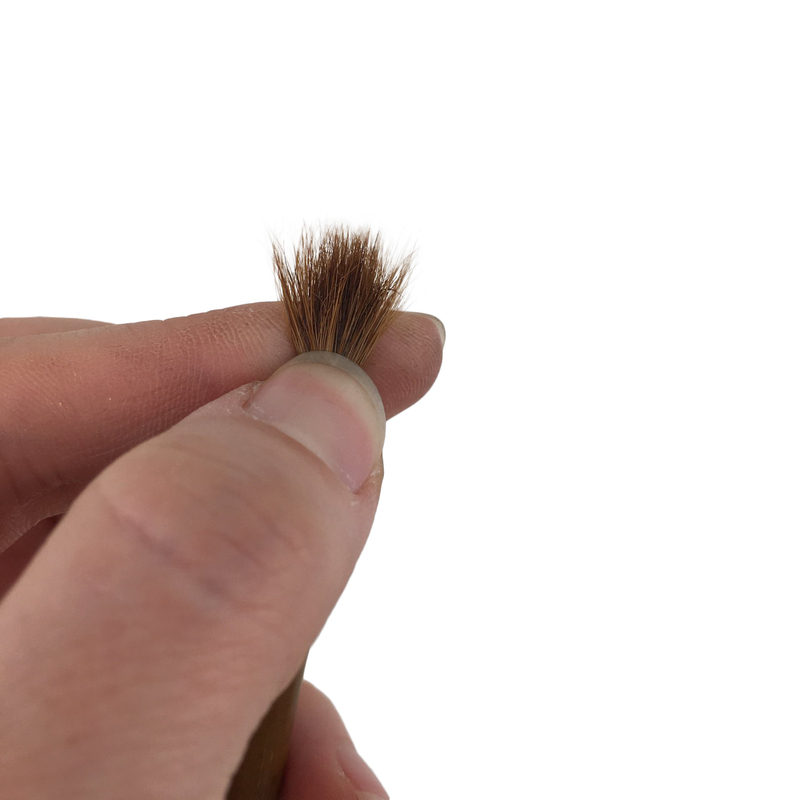 This is a goat hair brush that has a wonderful spring to it. I bought it for cursive and it performs flawlessly. Excellent construction. I can move from very thin line to thicker smoothly. 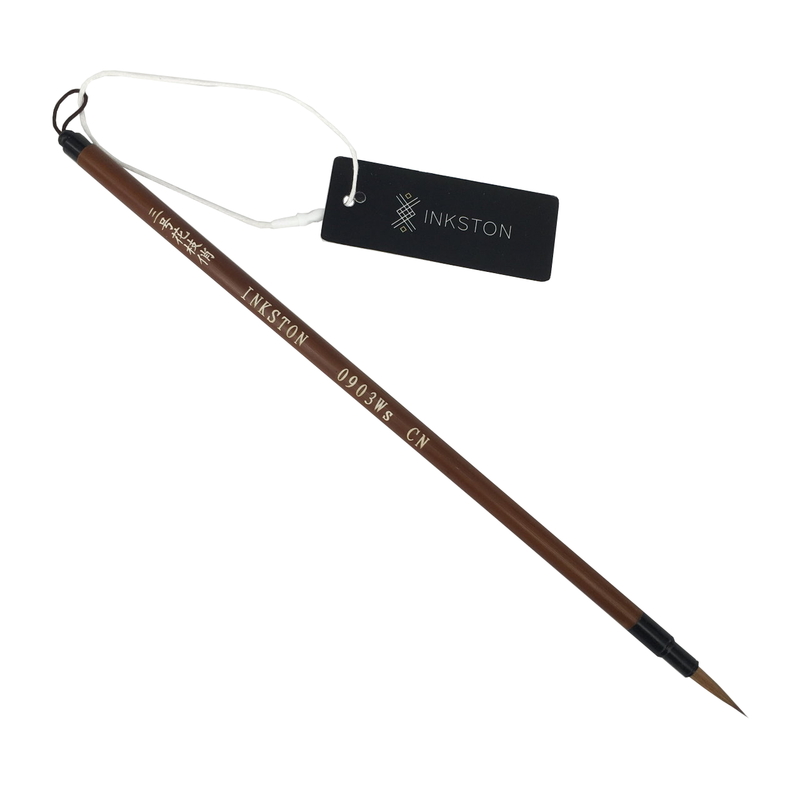 I have ordered several items both paper and brushes from Inkston and have been pleased each time. The price, the quality, and the service have always been excellent. 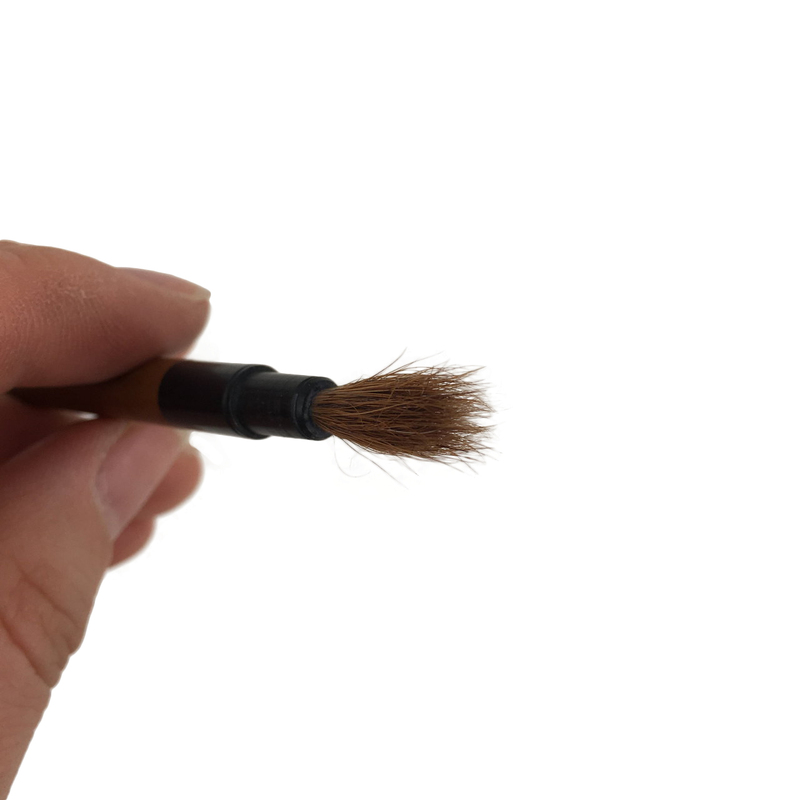 I have used the brush for fine and detailed work. I can think of no downside to the brush. It did come with a white silk sleeve that I would not recommend for brush storage but I may find some other use for it. This a fine brush. Muy contento. Lo utilizo para acuarela. Llevo varios meses usándolo y funciona perfectamente. Muy recomendable por su punta, muy fina y al mismo tiempo puede funcionar como pincel plano. I have been using this brush for several days. It holds a fine point when painting with ground Chinese ink. I am very pleased with the quality. I received my brush yesterday. I was very surprised at the wonderful quality of this brush. It is fabulous. I can’t wait to actually do a full painting with it. I tried it out and it dances on the paper! So excited. Inkston company also has my highest recommendation. They are a very classy company with top quality products. Every care is taken with your purchase. My brush came in a cloth holder and also had a sample of Xuan (rice) paper in a beautiful folded gold packet. Very special touch. This is a great brush! I found the Small Crane Neck on Amazon USA and purchased it from them. The shipping was fast and free under Amazon Prime. This brush is of excellent quality: the tip point is clean and springy through varying pressures. Some wool brushes I have tried don’t seem to stay unified in quite this way and I am pleased with how this brush works cursive and semi-cursive. Holds a good amount of ink. I am very happy with the Inkston quality. Recommended. 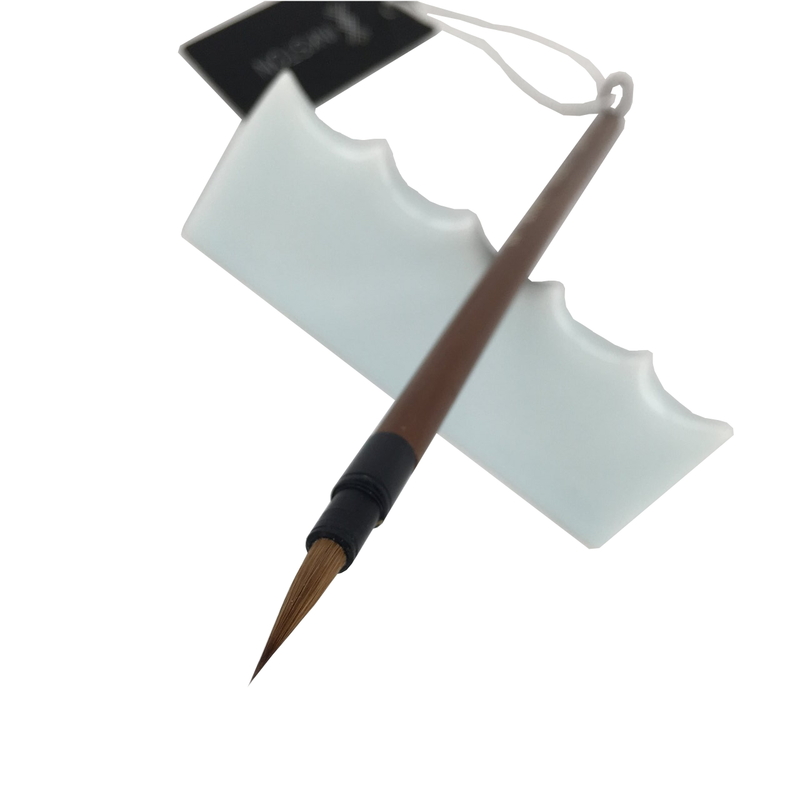 I just purchased this Diao Hao Marten brush through Amazon USA. I am thrilled with it. The long bristles have a lovely spring to them, the point is very well made and stays sharp. I also find that the width of the handle is just right for manipulating strokes. I bought this brush to use for cursive and semi-cursive and am very happy. Thanks Inkston! Realmente tiene una muy buena pinta. De agradecer las muestras de diversos papeles Xuan con incrustaciones de flores y hojas. Alta gama. Deseando probarlo.